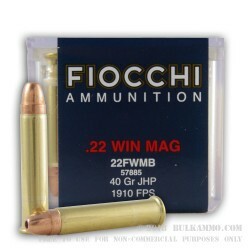 This .22 WMR hollow point ammo, manufactured by Fiocchi, offers great performance on the range or against varmints and small game such as squirrels, rats, and rabbits. The light copper-plated 40-grain bullet, backed by a strong powder charge, travels at 1910 feet per second at the muzzle for a much flatter trajectory than a .22LR projectile, giving the .22 WMR a much greater reach. An Italian company in business since the 1870s, Fiocchi Munizioni has operated under the ownership of the Fiocchi family since its founding. Not content to rest on its laurels, the company continuously seeks to improve its products and processes and has achieved multiple NATO and ISO certifications. 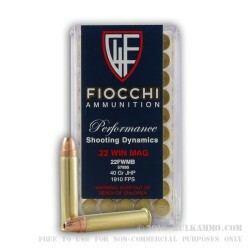 In the US, the company offers ammo in all the major categories including rimfire, shotgun, rifle, and pistol. Fiocchi’s main offices and production plant are located in Lecco, Italy. Although some of the company’s ammo is made in the United States, its rimfire ammo all comes from the original facility in Italy. 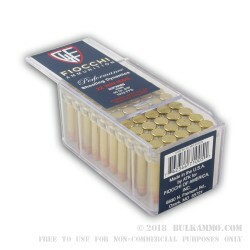 Fiocchi ammo enjoys a solid reputation for above-average quality and performance at a fair price. 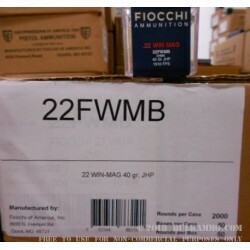 First purchase from Bulk Ammo, hard to find quality 22mag ammo at a reasonable price. Hopefully pricing will get more inline as supply comes back. Thanks for the many products you offer and the really great shipping.